When homeowners choose tile flooring, they get durability, style, and affordability. Tile flooring is the perfect fit for any room of your home, and the easy luxury of porcelain and ceramic comes at some of the most attractive prices per square foot. Our showroom and flooring store offers a wide selection of in-stock and ready- to-order tile floor options, and our expert tile floor installation team will lay your new floor on your schedule. Come in today to talk with a knowledgeable sales associate about upgrading your house with durable, low-cost floors. Any home can benefit from the modern look of stunning porcelain. A tile floor can be installed at below or above grade level for maximum flexibility for any part of your house. 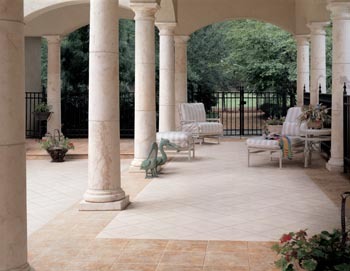 Porcelain’s frost resistance also makes it an excellent choice for indoor/outdoor spaces such as patios or entryways. Tile floors have a singular advantage that extends their lifespan immensely: even if the floor were to be damaged, replacing individual tiles is inexpensive and easy compared to the cost of replacing a whole floor of another material. This also makes it a great flooring material to flex your creativity with. With ceramic and porcelain tiles, you can create mesmerizing mosaics and designs that are completely unique and inspired by you. For thousands of years, designers have relied on ceramic tile for durable elegance in a variety of edifices. These structures have stood the test of time and are widely admired even today. Modern ceramic tile flooring retains this durability, and modern manufacturing techniques have turned it into one of the most flexible flooring options. Manufacturers have created glazed ceramic tiles in many shapes, colors, and textures, and the natural variation in tone of baked ceramic means that no two tile floors are alike. In addition, these floors are easy to install and maintain. Any room in your home can benefit from affordable, long-lasting ceramic or porcelain tile, especially bathrooms, kitchen, hallways, or even living rooms. Tile is also appropriate for kitchen or bathroom countertops or backsplashes, and our flooring experts can help you choose the right style and pattern to give your space a total refresh on your budget. Our installation professionals work on your schedule to bring your design vision to life, and our Ultimate Confidence Guarantee covers all of our 4 and 5 Star Rated floors. Tile is a great choice for any room in your house, but it is especially suitable for a high-traffic kitchen or bathroom. It’s easy to keep this flooring looking like new. Daily sweeping and regular mopping are all it needs, and any spills can be cleaned up in a moment with a household sponge. Glazed tile resists water stains and scratches, and the dirt-resistant grout lines keep allergens and pet dander from infiltrating your home. This makes tile the hypoallergenic, pet-friendly flooring option for any home. Tile floor benefits are many. They are impervious to areas with high moisture levels and high humidity conditions. They don’t stain and water doesn’t penetrate them. In addition to adding appeal to your home or business, tile floors add value to any property. Tile is a great choice for any room in your house, but especially suitable for a high-traffic kitchen or bathroom. It’s easy to keep your tile floors looking like new. Daily sweeping and regular mopping are all your porcelain or ceramic tile flooring needs, and any spills can be cleaned up in the moment with a household sponge. Glazed tile resists water stains and scratches, and the dirt-resistant grout lines keep allergens and pet dander from infiltrating your floor. This makes tile the hypoallergenic, pet-friendly flooring option for any home. The best way to protect your investment is to make sure it is installed properly from the start. Our professional tile floor installation team is able to remove your old flooring, thoroughly prepare the subfloor, and install your new tile flooring so that it lasts for many long years. Another benefit to utilizing our installation professionals is that you’re covered by our Lifetime Installation Guarantee. As long as you allow us to install your floors, we’ll fix any installation-related problems for as long as you have the floor. In addition, our Confidence Plus Warranty covers select floors. If you’re not completely happy with your 4- or 5-Star Rated floor within 30 days, we’ll replace it and even cover the cost of labor. Contact us today for more information on our tile flooring options. We proudly serve customers from Otsego, Minneapolis, Maple Grove, Brooklyn, Buffalo, Wayzata, and Plymouth, Minnesota, as well as all of the surrounding areas.